Whitelee Wind Farm with the Isle of Arran in the background. Wind power in Scotland is the fastest-growing renewable energy technology, with 5328 MW of installed wind power capacity as of March 2015. This included 5131 MW from onshore wind in Scotland and 197 MW of offshore wind generators. The Scottish Government has a target of generating 50% of Scotland's electricity from renewable energy by 2015, and 100% by 2020, which was raised from 50% in September 2010. The majority of this is likely to come from wind power. On Sunday 7 August 2016, a combination of high wind and low consumption caused more wind power generation (106%) than consumption in Scotland. Scottish wind turbines provided 39,545 MWh during the 24 hours of that date, while consumption was 37,202 MWh. It was the first time that measurements were available to confirm that fact. On average, year round, renewables contribute over half of Scotland’s energy. The 54-turbine Black Law Wind Farm has a total capacity of 124 MW. It is located near Forth in Lanarkshire and was built on old opencast coalmine site, with an original capacity of 97 MW from 42 turbines. It employs seven permanent staff on site and created 200 jobs during construction. A second phase saw the installation of a further 12 turbines. The project has received wide recognition for its contribution to environmental objectives. Over the period April 2009 to March 2010, Black Law Wind Farm produced 19.19% of its rated capacity. The Braes of Doune Wind Farm opened in 2007 and is located close to Stirling. The wind farm has 36 Vestas 2 MW wind turbines. The farm was built and is run by Airtricity. The Clyde Wind Farm is a 350 MW wind farm near Abington in South Lanarkshire, Scotland. The 152-turbine project by Scottish and Southern Energy, which was approved by the Scottish Parliament in July 2008, is capable of powering 300,000 homes. Turbines have been built either side of the M74 motorway. Construction of the wind farm, which is budgeted for £600 million, started in early 2009 and finished in 2012. The farm was opened at a ceremonial ribbon cutting by First Minister of Scotland Alex Salmond in September 2012. Crystal Rig Wind Farm is an operational onshore wind farm located on the Lammermuir Hills in the Scottish Borders region of Scotland. When it was completed in May 2004 it was the largest wind farm in Scotland. As a result of 3 extensions it is currently the 2nd largest wind farm in the UK, both in terms of nameplate capacity and number of turbines. The whole site has 85 turbines and a nameplate capacity of 200.5 MW. Farr Wind Farm is located some 10 miles south of Inverness, and comprises 40 wind turbines with a total installed capacity of 92 MW. Every year the wind farm generates enough clean electricity to meet the average annual needs of some 54,000 homes. Hadyard Hill wind farm. Located on the B734 between Old Dailly and Barr. Hadyard Hill Wind Farm, owned and operated by Scottish and Southern Energy (SSE), became the first wind farm in the UK with a capacity of over 100 MW. The 120 MW, 52-turbine wind farm in South Ayrshire cost £85 million and in a year generates enough electricity to power 80,000 homes, sufficient to supply every household in a city the size of York. The production of zero carbon electricity at the wind farm is expected to reduce emissions of carbon dioxide by almost 300,000 tonnes a year, equivalent to taking 70,000 cars off the road. Novar Wind Farm is a 50 turbine, 53.8MW wind farm located in the Scottish Highlands.Constructed in 1997, Novar was of the earlier developments of Scottish on-shore wind generation. It provided a significant contribution to the local economy during construction and through its Community Benefit Fund. In 2010 an additional 16 turbines were constructed taking the yearly generation capacity to 53.8MW. Whitelee Wind Farm, near Eaglesham, East Renfrewshire is the largest on-shore wind farm in the United Kingdom with 215 Siemens and Alstom wind turbines and a total capacity of 539 MW. There are many other large onshore wind farms in Scotland, at various stages of development, including some that are in community ownership. A panoramic view of the Whitelee wind farm with Lochgoin Reservoir in the foreground. The Viking Wind Farm in the Shetland Islands was first proposed as a 600 MW 150 turbine project in 2009. After reduction in scope due to environmental concerns about effects of wildlife and peat bog carbon release during construction, as well as potential interference with equipment at Scatsta Airport the scheme was approved in 2012 as a 103 turbine scheme of 370 MW. The scheme is expected to achieve high capacity factors due to wind conditions in Shetland, as the Burradale has a capacity factor just over 50%. Scotland's first offshore wind turbine was placed near the Beatrice Oil Field, 24 km (15 mi; 13 nmi) off the east coast in the Moray Firth, North Sea, in August 2006. This was the world's largest wind turbine at the time, an REpower 5M, with a maximum output of 5 MW. A second identical turbine joined it and the wind farm began supplying electricity in August 2007. As of February 2010, Beatrice Wind Farm is the deepest and northernmost offshore wind installation in the world. This was the first time such large offshore wind turbines had been tested, and the first time any wind turbine generators have been assembled in such deep (44 metres) water. Such large wind turbine generators are ideally suited to the offshore environment due to high consistent wind speeds and minimal turbulence. According to historical measures of wind speeds at the Beatrice offshore location, it is expected that the turbines will run 96% of the time (8440 hours per year), and at 10 MW full power 38% of the time (3300 hours per year). In January 2010 contracts were awarded for a major expansion of offshore wind power in the seas around Scotland. Moray Offshore Renewables will develop offshore wind power in the Moray Firth, and SeaGreen Wind Energy will develop offshore wind in the Firth of Forth. These developments could lead to 1,000 new wind turbines generating nearly 5,000 MW of power. Jobs "could also be created in manufacturing, research, engineering, installation, operation and services". In July 2016, RSPB challenged development in the Firth of Forth and Firth of Tay. Robin Rigg Wind Farm in the Solway Firth is Scotland's only commercial-scale, operational offshore wind farm, sited at Robin Rigg, a sandbank midway between the Galloway and Cumbrian coasts in the Solway Firth. It has 60 Vestas V90-3MW wind turbines with a total installed capacity of 180 MW. Scotland is also home to two offshore wind demonstration projects: The two turbine, 10 MW Beatrice Demonstrator Project located in the Moray Firth, and the single turbine, 7 MW Fife Energy Park Offshore Demonstration Wind Turbine in the Firth of Forth. There are also several other commercial-scale and demonstration projects in the planning stages. Hywind Scotland, is a floating wind farm 15 miles (24 km) off Peterhead with a capacity of 30 megawatts. Manufactured by Statoil, the windfarm is the first of its kind, with the five turbines non-rigidly attached to the sea floor with three anchors. Constructed between July and September 2017, power generation started in October 2017. Community-owned schemes in Scotland include one on the Isle of Gigha. The Heritage Trust set up Gigha Renewable Energy to buy and operate three Vestas V27 wind turbines, known locally as The Dancing Ladies or Creideas, Dòchas is Carthannas (Gaelic for Faith, Hope and Charity). They were commissioned on 21 January 2005 and are capable of generating up to 675 kW of power. Revenue is produced by selling the electricity to the grid via an intermediary called Green Energy UK. Gigha residents control the whole project and profits are reinvested in the community. Findhorn Ecovillage has four Vestas wind turbines which can generate up to 750 kW. These make the community net exporters of renewably generated electricity. Most of the generation is used on-site with any surplus exported to the National Grid. Boyndie Wind Farm Co-operative is part of the Energy4All group, which promotes community ownership. A number of other schemes supported by Community Energy Scotland are in the pipeline. The siting of turbines is often an issue, but multiple surveys have shown high local community acceptance for wind power in Scotland. Existing public policy with regard to wind power has become a topic of debate in recent years. In 2003, MORI Scotland was commissioned by the Scottish Executive to undertake a study examining the attitudes of people living close to Scottish wind farms. The survey showed that people living near Scotland’s ten largest wind farms strongly support more of Scotland's energy needs being produced by the wind. 82% wanted an increase in electricity generated from wind power, whilst more than 50% supported an increase in the number of wind turbines at their local wind farm. 20% say their local wind farm has had a broadly positive impact on the area, as opposed to a negative impact (7%). A survey conducted in 2005, and commissioned by the renewable energy industry, showed that 74% of people in Scotland agree that wind farms are necessary to meet current and future energy needs. When people were asked the same question in a Scottish Renewables study conducted in 2010, 78% agreed. The increase is significant as there were twice as many wind farms in 2010 as there were in 2005. The 2010 survey also showed that 52% disagreed with the statement that wind farms are "ugly and a blot on the landscape". 59% agreed that wind farms were necessary and that how they looked was unimportant. The 2010 study suggests that the majority of people in Scotland are in support of clean energy. However this survey has been widely criticised for its methodology, in that it used a weighting scale such that the opinion those who lived nearer windfarms was rated as of lesser importance. New YouGov research for Scottish Renewables shows Scots are twice as likely to favour wind power over nuclear or shale gas Over six in ten (62%) people in Scotland say they would support large scale wind projects in their local area, more than double the number who said they would be generally for shale gas (24%) and almost twice as much as nuclear (32%). Hydro power is the most popular energy source for large scale projects in Scotland, with an overwhelming majority (80%) being in favour. Siting of wind turbines has sometimes been an issue, as most people are concerned about the value of natural landscapes. The John Muir Trust has stated that "the best renewable energy options around wild land are small-scale, sensitively sited and adjacent to the communities directly benefiting from them". A small-scale scheme proposed by North Harris Development Trust has been supported by the John Muir Trust. A 2013 poll carried out by the John Muir Trust, suggests that 75% of Scots would like to see their wild areas protected from further development. Wind farm developers sometimes offer "community benefit funds" to help address any disadvantages faced by those living adjacent to wind farms. The Ardrossan Wind Farm on the west coast of Scotland has been "overwhelmingly accepted by local people". Instead of spoiling the landscape, local people believe it has enhanced the area. According to one of the town's councillors: "The turbines are impressive looking, bring a calming effect to the town and, contrary to the belief that they would be noisy, we have found them to be silent workhorses". The £90 million Black Law Wind Farm is located near Forth in Lanarkshire and has been built on an old opencast coalmine site which was completely restored to shallow wetlands during the construction programme. It employs seven permanent staff on site and created 200 jobs during construction. However, concerns over inappropriate siting of turbines has been voiced by groups in Fife, in particular, where the number of planning applications for turbines has risen sharply. This also is true of Berwickshire, which is home to the second largest windfarm in the UK, Crystal Rig Wind Farm, and where hundreds more turbines are due to be situated, contrary to the wishes of many residents of the county, and the John Muir Trust. Also, the siting of turbines in environmentally sensitive areas has led to the deaths of migratory and native birds, such as on Harris where a rare visitor to Scotland, a white-throated needletail was witnessed being killed by a turbine. Inevitably some carbon emissions are produced during construction and transport. The precise amounts involved are a matter of controversy. Manufacturers typically state that carbon emissions are 'paid back' within 3–18 months of production, but recent research claims that turbines located on peat bogs create incidental emissions that may increase this to 8 years or more. A 2013 financial analysis of utility companies such as the SSE (formerly Scottish and Southern Electricity) concluded that utilities were haemorrhaging cash. Construction of wind farms by the electrical generating industry lead to duplication of existing power plants which were still needed as backup without increasing the utilities customer base or their output. Scottish Natural Heritage has stated that the decommissioning of ageing turbine structures in the future would be more deleterious to the environment than leaving the bases in place, thus littering Scotland's wild land with concrete which though they could be covered with topsoil, could lead to "oxidising and subsequent staining/contamination" and would lead to irreversible damage to the sensitive peatlands on which many are built. Alternatively, new wind farms could be built on the same site, minimising overall damage. Some Scottish wind farms have become tourist attractions. According to a 2002 poll carried out by MORI Scotland, "nine out of ten tourists visiting some of Scotland's top beauty spots say the presence of wind farms makes no difference to the enjoyment of their holiday, and twice as many people would return to an area because of the presence of a wind farm than would stay away". The Whitelee Wind Farm Visitor Centre has an exhibition room, a learning hub, a café with a viewing deck and also a shop. It is run by the Glasgow Science Centre. Economic impact studies have also been undertaken that looked at the impact of the development of onshore wind on the local tourism sector. This found that wind farms did not harm the employment in the tourism sector in the areas surrounding wind farm and in fact, in the majority of the case studies the tourism sector in the immediate local area performed better than in the wider local authority. A 2016 study found no connection between tourism and wind power. Most turbines in the European Union produce electricity at an average of 25% of their rated maximum power due to the variability of wind resources, but Scotland's wind regime provides average capacity factor of 31% or higher on the west and northern coasts. The load factor recorded for the onshore North Rhins windfarm near Stranraer was 40%, which is typical for well-sited mainland windfarms. A small wind farm on Shetland with five Vestas V47 660 kW turbines recently achieved a world record of 58% capacity over the course of a year. This record is claimed by Burradale windfarm, located just outside Lerwick and operated by Shetland Aerogenerators Ltd. Since opening in 2000, the turbines at this wind farm have had an average capacity factor of 52% and, according to this report, in 2005 averaged a world record 57.9%. However, a Scottish opposition group found 124 separate occasions from 2008 to 2010 when the nation's wind output fell to less than 2% of installed capacity. On the west and northern coasts Scotland's wind regime can provide an average of 40% or higher. It is estimated that 11.5 GW of onshore wind potential exists, enough to provide about 45 TWh of energy in a year, allowing for wind variability. More than double this amount exists on offshore sites where mean wind speeds are greater than on land. The total offshore potential is estimated at 25 GW, and although more expensive to install could be enough to provide almost half the total energy used in Scotland. According to a recent report, the world's wind market offers many opportunities for Scottish companies, with total global revenue over the next five years estimated at £35 billion and continued growth forecast until at least 2025. 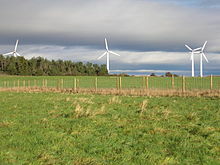 Wikimedia Commons has media related to Wind power in Scotland. ^ "Energy Trends: renewables". www.gov.uk. ^ "Target for renewable energy now 80 per cent". Scottish Government. 23 September 2010. ^ Europe's Largest Onshore Wind Farm Is Switched on in Scotland Renewable Energy World, 20 May 2009. ^ "Scotland just produced enough wind energy to power it for an entire day". The Independent. 11 August 2016. Retrieved 12 August 2016. ^ Association, Press (11 August 2016). "Scotland's wind turbines cover all its electricity needs for a day". The Guardian. ISSN 0261-3077. Retrieved 2 September 2016. ^ Weaver, John Fitzgerald (14 August 2016). "Scotland blows away the competition – 106% of electricity needs from wind – joins select club". Electrek. Retrieved 2 September 2016. ^ a b c "UK's most powerful wind farm could power Paisley". bwea.com. ^ "UK Renewable Energy Generation - Summary April 2009 to March 2010" (PDF). clowd.org.uk. ^ "Braes of Doune". airtricity.com. ^ Haworth, Jenny (22 July 2008). "Wind farms: now we've got the biggest in Europe". Retrieved 22 July 2008. ^ Johnson, Simon (21 July 2008). "Europe's largest onshore wind farm is to be built in Scotland costing £600m". Telegraph.co.uk. London: Telegraph Media Group. Retrieved 22 July 2008. ^ "Green light for massive wind farm". BBC News. 21 July 2008. Retrieved 22 July 2008. ^ "Salmond opens SSE's Clyde wind farm". ^ AG, RWE. "RWE Group - Corporate Website". www.npower-renewables.com. ^ "Hadyard Hill becomes the first wind farm in the UK to generate over 100 MW of power". bwea.com. ^ a b "Burradale Wind Farm Shetland Islands - REUK.co.uk". www.reuk.co.uk. ^ "beatricewind.co.uk - beatricewind Resources and Information". www.beatricewind.co.uk. ^ ""Beatrice is currently the northernmost and deepest offshore wind farm in the world"". myiris.com. ^ a b "Worlds Largest Wind Turbine Generator - REUK.co.uk". www.reuk.co.uk. ^ New offshore wind farm contracts announced BBC News, 8 January 2010. ^ "Wind farm legal challenge victory". 19 July 2016 – via www.bbc.co.uk. ^ "Scots offshore wind 'pretty much dead'". 20 July 2016 – via www.bbc.co.uk. ^ ceu@scotland.gsi.gov.uk, Scottish Government, St. Andrew's House, Regent Road, Edinburgh EH1 3DG Tel:0131 556 8400 (8 December 2009). "Current Marine Renewable Energy Projects". www.gov.scot. ^ Harrabin, Roger (23 July 2017). "World's first floating wind farm emerges off coast of Scotland". BBC News. Retrieved 23 July 2017. ^ "Nå starter monteringen av Statoils flytende vindmøller". SYSLA. 17 February 2017. Retrieved 20 February 2017. ^ "Floating turbines deliver first electricity". BBC News. 18 October 2017. Retrieved 18 October 2017. ^ Geuss, Megan (18 October 2017). "First floating wind farm, built by offshore oil company, delivers electricity". Ars Technica. Retrieved 18 October 2017. ^ "Let's Talk Renewables" (PDF). HIE. Archived from the original (PDF) on 7 April 2008. Retrieved 6 January 2008. ^ "Green Energy press release". greenenergy.uk.com. 26 January 2005. Retrieved 1 February 2007. ^ Boyndie Co-operative Retrieved 6 July 2007. ^ a b "Rise in Scots wind farm support". BBC News. 18 October 2010. ^ a b Scottish Government (2003). "Public Attitudes to Windfarms: A Survey of Local Residents in Scotland". ^ Scottish Renewables (22 October 2010). "Scots support wind farms". Sustainable Scotland. ^ "Scots support wind farms". Sustainable Scotland. 22 October 2010. ^ "Public Perceptions ✭ - WAG - Windfarm Action Group - the growing blight on the good earth ☯". windfarmaction.com. ^ Cordelia Nelson (20 March 2013). "Scots support renewable energy". YouGov. ^ "What's Your View on Wild Land?". Pitlochry: John Muir Trust. 2006. Retrieved 13 November 2007. ^ John Muir Trust. "Renewable Energy Policy". Retrieved 20 April 2008. ^ "North Harris Community Wind Farm Approved". John Muir Trust. 18 February 2008. Retrieved 21 April 2008. ^ "Public 'backs wild land turbine ban'". 26 June 2013 – via www.bbc.co.uk. ^ "Wind farm community benefits". berwickshirenews.co.uk. ^ "Residents 'devastated' at wind farm decision". berwickshirenews.co.uk. ^ "Uproar over wind farm vote". berwickshirenews.co.uk. ^ a b Gourlay, Simon (11 August 2008). "Response: Wind farms are not only beautiful, they're absolutely necessary". the Guardian. ^ "Eftag - Collection of Chair Design Ideas". Eftag. ^ "Petition to protect the country's wild lands". berwickshirenews.co.uk. ^ "Fallago Rig wind farm development sold". BBC News. 2 February 2012. ^ "Scottish Borders Council windfarm applications up to 1 July 2012". scotborders.gov.uk. ^ "Twitchers see rare bird hit turbine". 27 June 2013 – via www.bbc.co.uk. ^ Douglas E. (8 July 2006) "Gone with the Wind". London. New Scientist. ^ Johnson, Simon (25 June 2013). "Old wind farms bases 'could be left in countryside'" – via www.telegraph.co.uk. ^ "Whitelee Windfarm". Scottish Power Renewables. ^ BiGGAR Economics. "Onshore Wind Energy and Tourism in Scotland". BiGGAR Economics. Retrieved 2 August 2016. ^ "ECN report on Renewables" (PDF). Retrieved 4 February 2007. ^ a b RSPB Scotland, WWF Scotland and FOE Scotland (February 2006) The Power of Scotland: Cutting Carbon with Scotland's Renewable Energy. ^ "Global wind power at 80 m". www.stanford.edu. ^ "Huge potential growth forecast for Scottish wind industry". scottish-enterprise.com.